Gazprom says the decision to charge a higher price was made because Ukraine has failed to pay off its debt for past supplies, which now stands at $1.7 billion. MOSCOW - Russia on Tuesday sharply hiked the price for natural gas to Ukraine and threatened to reclaim billions previous discounts, raising the heat on its cash-strapped government, while Ukrainian police moved to disarm members of a radical nationalist group after a shooting spree in the capital. People pass barricades near the Dnipro Hotel in Kiev, where a tense standoff between Ukrainian police and a radical nationalist group Right Sector ended Tuesday when its members surrendered their weapons. Their departure followed a shooting spree in which a Right Sector member shot and wounded three people, including a deputy mayor, outside a restaurant adjacent to the capital's Independence Square. NATO foreign ministers were gathering for a two-day meeting in Brussels to consider further steps in the wake of Russia's annexation of Crimea, including measures to reassure the Baltic states, Poland, and Romania that the alliance would help guarantee their security. Alexei Miller, the head of Russia's state-controlled natural gas giant Gazprom, said Tuesday that the company has withdrawn December's Discount that put the price of gas at $268.50 per 1,000 cubic meters and set the price at $385.50 per 1,000 cubic meters for the second quarter. The discount was part of a financial lifeline which Russian President Vladimir Putin offered to Ukraine's President, Viktor Yanukovych, after his decision to ditch a pact with the European Union in favor of closer ties with Moscow. The move fueled three months of protests which led Yanukovych to flee to Russia in February. Radical nationalist groups played a key role in Yanukovych's ouster, but they quickly fell out with the new government. Many activists are still encamped on Kiev's Independence Square, known as the Maidan, and have signaled their intent to remain there until the election of what they deem to be a legitimate government. Last week, one of the leaders of the most prominent radical group, the Right Sector, was shot dead while resisting police. Right Sector members then besieged parliament for several hours, breaking windows and demanding the resignation of Interior Minister Arsen Avakov. They lifted the blockade after lawmakers set up a panel to investigate the killing. Late Monday, a Right Sector member shot and wounded three people outside a restaurant adjacent to Kiev's main Independence Square, including a deputy city mayor, triggering a standoff that lasted overnight. Police responded by surrounding the downtown Dnipro Hotel, which Right Sector had commandeered as its headquarters, demanding that the radicals lay down their weapons and leave. Avakov said that Right Sector members agreed Tuesday to leave their weapons behind and went to a suburban camp, escorted by officers of Ukraine's Security Service. The Ukrainian parliament then voted to order police to disarm all illegal armed units. Backers of the measure said the drive was needed to combat a recent surge in violent crime and to defuse the risk of provocations by "foreign citizens" in Kiev and the south and east of Ukraine, heavily Russian-speaking regions where anti-government groups have rallied over the past several weekends in calls for secession. In March, authorities launched a broad appeal for the voluntary surrender of weapons, many of which went astray from police depots during months of unrest. The government has said a similar amnesty will remain in effect in April. If police disarm nationalists and other radical groups, it would undermine Russia's key argument: the allegation that the new Ukrainian government was kowtowing to nationalist radicals, who threaten Russian-speakers in southeastern Ukraine. Russia has pointed at the perceived threat from ultranationalists to defend its annexation of Crimea, and has concentrated tens of thousands of troops along its border with Ukraine, drawing Western fears of an invasion. Putin and other officials have said that Russia has no intention of invading Ukraine. Defense Minister Sergei Shoigu insisted Tuesday that the Kremlin wants a "political settlement that would take interests and rights of the entire Ukrainian people into account." NATO Secretary General Anders Fogh Rasmussen said he couldn't confirm reports of a Russian pullback from Ukraine's borders. 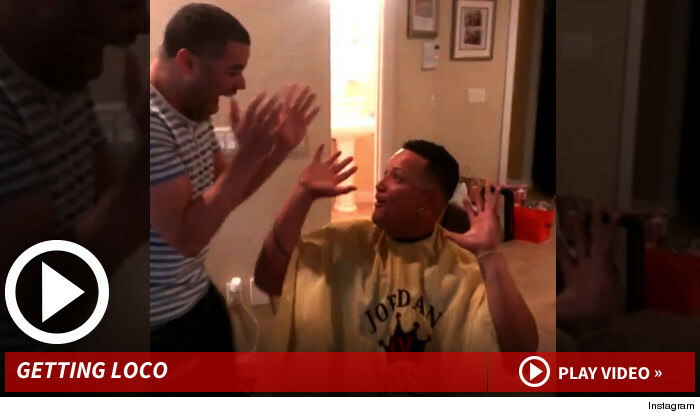 Miguel Cabrera might be happy about his $292 million contract -- but his barber flat out lost his mind celebrating the ridiculous deal ... and tells TMZ Sports he just got a fat raise from the Tigers slugger. 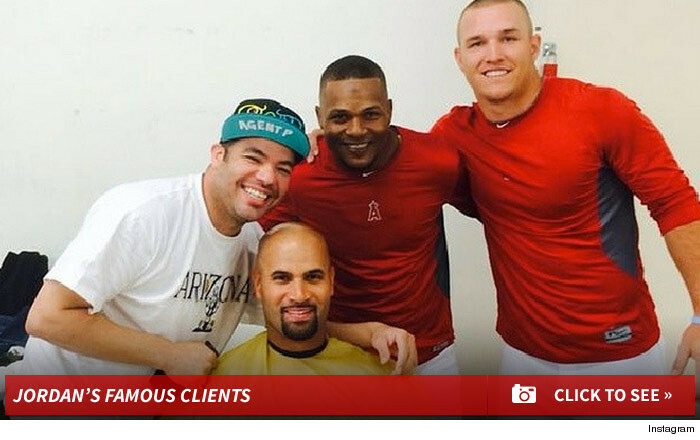 Moises Lopez , or as he's known in the biz ... "Jordan the Barber" -- because he's the best -- was at Miguel's house in Florida when he got the call about the record-setting deal. The video is awesome -- after Miguel hangs up, Jordan says in Spanish ... "We're gonna go crazy" ... and busts out the world's first $292 mil shuffle. Jordan tells us, "Miguel said he's gonna pay me double from now on." Dude is worth it. Jordan also tightens up the domes of Albert Pujols, Robinson Cano, Felix Hernandez, and CC Sabathia. Jordan is based out of NYC where he has 2 barbershops ... but keeping up with Miguel during the season won't be a problem -- "[Miguel] said he might send for me in a private jet." Go here to get a new coupon from Gap Factory Outlet good for $25 off $75 purchase for four days only. Every worker at Energex Tube will be laid off within two months. It's uncertain if they'll ever return to their jobs. Employees at the Dain Ave. plant - formerly Lakeside Steel - were told Monday a decision was made to idle operations "for an undetermined amount of time" due to market conditions and "unfairly traded imports into North America." "This will result in the indefinite layoff of all hourly employees until business conditions change," said a layoff notice obtained by The Tribune. The company provided eight weeks' notice of indefinite layoff, effective Monday. It will continue to extend health and insurance benefits for the duration of the layoff, the notice said. Rick Alakas, president of Canadian Auto Workers Local 523, is trying to hold onto some optimism. But closure weighs heavily on his mind. "I am very concerned about the future of that plant," he said Tuesday. "This setback is a real blow to us." Alakas said the layoffs apply to everyone there - 126 hourly workers and 36 salaried employees. "It's a very difficult period," he said. "It's emotional and it's difficult, not only for our members in the plant, but for their families." He said a meeting is being planned to address workers and their spouses or partners next Tuesday about what will happen in the coming weeks and to give them a sense of what's happening with the North American steel industry. He said workers for now will complete scheduled production jobs and then move into cleanup mode for the shutdown. Energex Tube is owned by U.S.-based JMC Steel Group, which purchased the plant for $58 million in April 2012. An announcement posted on the Energex Tube website Tuesday said: "Despite significant operational improvements within the Canadian plant, market conditions, primarily the influx of unfairly traded OCTG (oil country tubular goods) imports into North America, have greatly reduced the ability for our Welland, Ont., operation to be profitable. The company has decided to idle operations located at 160 Dain Ave."
It went on to say: "We expect that all layoffs will be completed by May 19, 2014. This announcement and timeline are based on the best information currently available but may be affected by various factors. Energex would like to thank our customers and employees for their continued support." JMC Steel spokesman Jelani Rucker and Energex Tube president Randy Boswell could not be reached for comment Tuesday. JMC Steel, too, blamed low-priced imported steel products for its decision to cut 110 Welland jobs in July 2012. Work began last May to demolish more than half the buildings at the Welland plant. Demolition started with more than 50% of the structures there, and subsequent plans called for the demolition of buildings along Ontario Rd. that had been used for finishing 16-inch pipe. In total, more than 37,000 square metres (400,000 square feet) of buildings were to be demolished. The company announced in late 2012 that it was phasing out of the furnace review production of its eight-inch pipe and at that time permanently cut 94 jobs. "The future is difficult. We are holding out hope that there is opportunities for that plant to resume operations," Alakas said. "This isn't the first plant that's been idled" in the steel industry, he said. "What we're experiencing in Welland is nothing new." He said the shutdown will cause a ripple effect in the community, be it for suppliers, transporters or restaurants and shops - "pretty much across the board." "It's another sad day for the city," said Welland Mayor Barry Sharpe, "and I'm sure it's absolutely devastating news for the employees and their families." He said the last time he was involved in a corporate call with the company was February 2013, "and it ended in a positive note" about plans for the future that included a stretch production mill and new furnace, some of those plans which were followed up on. Sharpe said following a meeting with city manager Craig Stirtzinger Tuesday the municipality is willing to support any case put forward to support North American steel workers. "We're prepared to step forward if there's a need to meet the minister of economic development," he added. Still, the massive scope of the issue for which Energex appears a victim "makes you feel pretty powerless," the mayor said. Dumping charges levelled by North America's steel industry go back well over a decade, and it seems nothing has been yet done to look after domestic jobs. Welland MP Malcolm Allen said the Canadian government has left industry problems to be ironed out in courtrooms, but small- and medium-sized industries and related machine shops - and those shrinking big companies - don't have millions of dollars to throw toward uncertain outcomes. Many finished steel products coming into Canada, he said, are arriving at prices lower than the international market price for the raw material. "In my view, it's purely dumping - no doubt about it." Trade agreements with countries where environmental control standards are lesser and labour costs are lower, but where it's also difficult to identify points of subsidization, need to be re-examined, Allen said. "Welland is a microcosm of what has happened across the broader sector of manufacturing in Ontario," Allen said. "It's extremely troubling," he said of the local Energex plant, "since they've done so many things over there to be competitive." <Discountp>Rocketcat Games make some of my favorite iOS titles, and ever since they announced a spinoff to their action RPG Mage Gauntlet [$2.99] at last year's GDC, I've been dying to get my hands on a finished version. However, it's been a longer development cycle than Rocketcat expected, and it's seen several versions and name changes in the two and a half years since they began working on it. The bright side is that all that extra development time means the game, now known as Wayward Souls, is absolutely stuffed with crazy features, enemies, items and playable characters. Rocketcat's always entertaining Kepa Auwae walks us thro ugh a lengthy demo of the latest version of Wayward Souls. Enjoy. As I mentioned in the opening and we touched on in our conversation, Wayward Souls has a lot of depth in terms of character progressions and sheer variety of enemies and environments. By Kepa's own admission, it's a very niche and difficult game, but I think there's definitely an audience on iOS who will absolutely fall in love with Wayward Souls. The goal is to submit the game and have it release before PAX begins on April 11th, so if all goes according to plan, we'll finally be playing Wayward Souls in the next few weeks (fingers firmly crossed). COUP is the solution to the largest problem in discount advertising. COUP has found a way to monetize the mobile revolution and society loves them for it. Several demographic and economic changes will help drive COUP's market capture and penetration. Coupons.com ( COUP) provides digital coupons. It offers Price Compare, social, mobile, and loyalty card promotions. The company provides a collection of money saving printable or save to card coupons on the Web; coupon codes for saving on online purchases from online merchants; and daily deals for discounts on products and services from local businesses, a well as offers Grocery iQ, a shopping-list application that allows users to create, organize, and share shopping lists, and find and use coupons. It provides DFSI, a digital free standing insert; online marketing campaigns, email, and social media programs; and print and mail, clearing, and advertising solutions to brand marketers. The company also offers solutions for publishers to monetize Website traffic, including custom-b randed microsites; and Brandcaster, a self-service coupon syndication platform. In addition, it offers APIs for developers to integrate Coupons.com coupons into their products. Further, the company provides family codes on coupons, customer care solutions, customer support, and coupon processing services. It serves consumer goods manufacturers, advertisers, retailers, promotional marketing firms, pharmaceutical, and other companies. So are they an advertiser? Does anybody even use coupons? Not really an advertiser, but they do let the advertisers do all the heavy lifting for them in a traditional sense, and YES people DO use coupons. We'll get to THAT later in the article. For now, lets take a look at the coupon business in general. The coupon business has been around since 1887 when the Coca-Cola Company first introduced a coupon for a free drink. They placed their coupon in the hands of one in every nine Americans between 1887 and 1913 and this promotion helped them become the global force that they are today. Of course their story isn't that simple, but it all started with their initial dip into the coupon market. The coupon business has gone through some very dramatic changes since inception and has evolved (devolved) into the modern day mess that it is. We'll get to THAT later in the article as well. Currently, 305 billion paper coupons are distributed annually, representing an aggregate discount value of $467 billion, with 2.9 billion being redeemed, representing an aggregate discount value of $3.7 billion saved, according to an annual industry report by NCH Marketing Services, Inc., a provider of coupon audit and settlement services. It's hard to quantify the amount of digital coupons being distributed but based on what we are able to put numbers behind, a recent report from Juniper Research suggests that the mobile coupon market will be worth $46 billion by 2015, "Mobile coupons are going mainstream, cost effective mobile coupon campaigns are now within the reach of smaller retailers providing them with an easy way to drive profitable footfall and build customer loyalty. To ignore the potential of mobile coupons would be to ignore the future of mobile commer ce". This is just an outline description of the coupon market, not the primary focus of this article, but I do think it's important to understand the potential that is available to a company who can bring together a portion of the opportunity. I happen to agree with the study findings at Juniper. The coupon market is huge and as time goes on I think the trend will continue towards mobile. Companies that can form recognized platforms with reputations of excellence should stand to make a lot of money. Even currently in the paper coupon dominated world the problem isn't potential, its execution. How can COUP improve the numbers mentioned above? The goal of any advertiser always has been and always will be to gather as many eyeballs and ears as possible and direct them to their product. The problem is the current methods present as many problems as they do potential. Currently, the most widely used methods of distributing coupons (a form of advertising) are: direct mailers, advertisements in sector exclusive channels (meaning per client advertisements to a particular grocery chain, or furniture store, etc), product specific coupons for loyalty programs (no "hard" coupon but a secondary price tag on the product that gives the coupon price for the loyal customer), brand specific coupons not advertised but presented on the particular brands website (printable at the consumers discretion), and television and radio ads that inform the customer of the "sales" available based on the above mentioned product specific coupons. You can see how the current methods put the majo rity of the workload on the advertisers and muddy the waters between brand building and trying to move discounted inventory. -Engagement with the consumer - "Our platform allows CPGs to better engage with consumers by enabling multiple touchpoints during a consumer's shopping experience. For example, a consumer can use our mobile app while they are walking through the aisle of a retailer, find a coupon for their favorite detergent ,save the coupon directly to the retailers loyalty program and receive the discount automatically at the point of sale without the need to present a physical coupon"
-SPEED - "Our ability to deploy promotions in days rather than weeks or months provides brands the ability to strategically allocate promotion spending to drive increased sales of their products." Taking advantage of quick shifts in shopping behavior can be the difference in selling a product and furthering a markdown (hurting margins). -Leverage CPG promotion content to increase sales - "Retailers can integrate promotions from our platform into their point of sale systems, retailer-branded websites, retailer loyalty/rewards programs, mobile applications and social media programs. By offering CPG promotions from our platform through their own digital channels, retailers are able to increase sales of the CPG promoted product at their locations and increase consumer loyalty." Absolute no brainer. -Recurring income from COUP not ordinary to coupon usage - "Retailers receive a distribution fee from us when we generate revenues from a digital promotion transaction on the retailer's website or through its loyalty reward program. Retailers benefit from an additional source of revenues not available with traditional coupons, in addition to driving purchases of the CPG products at their stores. -Integration with retailer point of sale systems - customer is no longer required to present a paper coupon (less work for the consumer has shown to equal more usage), cuts down on check-out time, improves the customers experience in store, builds loyalty via "savings", and simplifies the processing of coupons. -Personalized promotions - "Our point of sale solutions and mobile applications help consumers save time and money by optimizing and personalizing the presentation of promotions.A consumer using these products will be presented with a set of optimized promotions based on their prior coupon selections, geography and other demographic and behavioral attributes." The search engine of coupons, only this search engine makes relevant suggestions. COUP takes advantage of an obvious need in a way that presents a clear value add to all parties involved in the sales process. Lets take a look at COUP's growth strategy going forward. COUP's business model has been slowly developing into what they hope is an unstoppable force. They already have over 2000 brands and a network of over 30,000 publishers committed to what amounts to a joint venture. The significant reach of their ability to promote to consumers increases their value to other CPG's and retailers, which in turn increases their network and increases their value to consumers. So as they develop one train of their business the other train naturally develops as well. They've built an incredible amount of momentum and made a focus of putting in place the infrastructure to operate at a much larger scale, always focusing on the next level of capabilities. Revenues at COUP grew from $27.2 million in the quarter ended September 30, 2012 to $39.7 million in the quarter ended September 30, 2013 while operating expenses declined from $33.1 million to $29.0 million and net loss declined from $16.6 million to $1. 6 million over the same period. This is an incredible set of numbers from a company this size. If they continue to develop at the same pace, I don't think it's out of the question to imply that they stand a good chance at developing at a faster pace (based on network exponentiation), they could become a household name and Wall Street darling by the end of 2014. The aggregate of all CPGs that used COUP's platform during the nine months ended September 30, 2011 increased their promotion spending with COUP two years later during the nine months ended September 30, 2013 by 44% over the amount spent during the nine months ended September 30, 2011.This is because what COUP is doing, is working. The company will continue to deepen existing relationships, develop new relationships, further their saturation across secondary and tertiary circles of influence, and expand on the 940 million transactions they did in the first nine months of 2013. They'll continue to take advantage of the disappearing stigma of using coupons and hopefully capture a large portion of the market that is moving to entirely digital usage. The consumer, especially those who have come of age during the last five years, has become incredibly cost conscious and sensitive. COUP helps brands create value and loyalty with this new wave of shoppers and helps the brands move volumes of inventory that otherwise would be at risk of further markdowns. In 2012, COUP generated revenues of $112.1 million, representing 23% growth over 2011, a net loss of $59.2 million, representing an increase of 158% over 2011, and an Adjusted EBITDA loss of $47.3 million, representing an increase of 233% over 2011. During the nine months ended September 30, 2013, COUP generated revenues of $115.3 million, representing 51% growth over the same period in 2012, a net loss of $12.8 million, representing a decrease of 75% over the same period in 2012, and an Adjusted EBITDA loss of $3.5 million, representing a decrease of 91% over the same period in 2012.Numbers like these suggest that COUP is on the front end of what should be an incredible run as they develop into the industry leader for this new, now necessary, player in the sales process. I like COUP for a long term hold or for somebody looking for a beta sensitive, growth oriented company in the short term. Currently, COUP is trading in the middle of a range that is has traded in since IPO which leaves a bit of room to the upside in the very short term but what I am most interested in is the mid to long term growth potential of the stock. The stock is grossly undervalued, in my opinion, based on the low levels of CAPEX needed to expand the existing model (the CAPEX required to build the infrastructure has already been priced into the IPO pricing, the growth mentioned above has not), the ability to generate revenues based on whether a customer actually uses a coupon or simply downloads the coupon to the platform ("Each time a consumer selects a digital coupon on our platform by either printing it for physical redemption at a retailer or saving it to a retailer online account for automatic digital redemption, we are paid a fee which is not dependent on the d igital coupon being redeemed"), the ability for the company to generate advertising revenues when they advertise in correlation to coupon placements on the COUP platform, and the many secondary services COUP can provide as value adds for existing and new business ( Grocery iQ, DFSI, custom-branded microsites, etc). The company has shown the ability to cut adjusted EBITDA losses by 91% over the last two years and that was taking into account the above higher run rate of CAPEX. I happen to believe that as COUP further entrenches themselves as the industry leader and can further demonstrate the ability of their network that they will be able to negotiate larger concessions from customers when it comes to the splits in revenue generations (pay per click, fee paid to retailers or CPG companies for third party coupon usage generation, etc). The company, during their IPO roadshow, announced being adjusted EBITDA positive and this will most likely lead them to carry through with the expressed desire to begin looking for strategic acquisition targets that can allow expansion or deeper penetration into the target markets. They have had over 7 million downloads of their mobile application and this is without heavy spending on advertising the actual services of the company. The overwhelming large percentage of CAPEX to this point has been on infrastructure development as mentioned above. A switch to a focused spending on advertising or the acquisition of a company that can expand integration of their app to more mobile devices will do nothing but accelerate overall revenues and profitability. COUP is currently trading at around 15X trailing sales and growth/tech oriented stocks have been known to trade between 30x-60x sales depending on the hype and prevailing macro environments. With management expressed models calling for 30-32% adjusted EBITDA on 66% to 68% gross margins, this stock has a lot of room to run to the upside. I think once the stock settles into a more established range and can display a lowered volatility that bank upgrades will quickly follow, which will move the stock as well. I like the valuation at just under 2 billion and think that this company will be doing at least 750 million in sales ANNUALLY in five years or less. That would put the stock trading in the $100-105 range, the bottom of the range pricing in room for any necessary expansion of the share float. IF COUP can continue along the path of predictable results, one that they have had great success is following, I could see their stock rapidly increasing in price based on the projected organic growth and the growth that they would be acquiring. If you're in PPC, you'll undoubtedly have heard about Hanapin Marketing's HeroConf, the world's largest PPC conference. If you're thinking of attending HeroConf 2014, you won't find people wearing capes, masks or spandex leggings (well, probably not, anyway). However, you will find WordStream and many other PPC experts speaking about the hottest topics in paid search. HeroConf 2014 will take place at the Hilton Austin Hotel in beautiful Austin, TX, from April 28-30. The Hilton Austin is nestled in one of the city's trendiest areas, and is located just two blocks away from Austin's historic 6th Street entertainment district. During HeroConf 2014, WordStream's very own Director of Search Engine Marketing, Rich Griffin, will be speaking about "The Truth Behind Quality Score (No, Really)," a must-see talk about the ins-and-outs of this important PPC metric. Of course, HeroConf is known for much more than its quality speakers, diverse program of events and ability to leap tall buildings in a single bound. Attendees will be able to demonstrate their athletic prowess during table tennis tournaments, watch the latest films at private movie screenings, and enjoy complimentary drinks at the event's open bar. Oh, and there will be plenty of chances to commemorate the occasion with some awkward and/or hilarious photos at HeroConf's special photo booths - form-fitting clothing optional. As a sponsor and speaking partner of HeroConf 2014, WordStream wants to give you the opportunity to attend this unique event at a 10% discount. Simply use the Deal Now "WordStream10" when registering to get your discounted tickets. Passes are selling out fast, so don't delay - don your trusty utility belt and attend the year's biggest and best PPC event. We'll see you there! It's that time of year again! In the spirit of NCAA March Madness, PPC Hero is running its Search Marketing Madness bracket again, and now's the time to cast your vote! The contest features four categories - Best PPC Conference, Best PPC Blog, Best PPC Software and Best PPC Manager. Weigh in and you could win a free registration to HeroConf 2014. Enter here for a chance to win!